For over 25 years now we have worked on a multitude of extremely rare and unique items, the vast majority for one particular dealer who specializes in antique French metalwork pieces. A lot the work we’ve undertaken has been metalwork repairs, reconstructions and reclamation. We have done a lot of brasswork, copperwork and worked with zinc, cast and wrought iron, quite frankly whatever’s thrown at us! I wish we had taken photos of all our antique work over the years. We have probably worked on French lanterns more than any other single type of item. From small repairs, solder work or straightening damaged areas to complete reconstructions or rebuilds sometimes with new sections. Our client always had a huge amount of reclamation and a stock of damaged original pieces that we would often use to replace damaged sections. This was handy when working with wrought iron because you can’t just go and buy a 200 year old rusty piece of genuine wrought from B&Q. 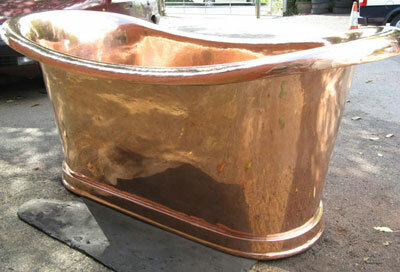 This 200 year old roll top copper bath arrived with us weathered and damaged and in need of some tender loving care. The bottom needed a complete overhaul and was dismantled, re-shaped, a new outlet installation and had small pin holes that needed repairing. The steel rim inside the plinth was also rusted through and needed replacing. The copper sides where stretched with heavy denting after most probably years as a French cattle troff. The roll top needed re-shaping and that too was stretched and split in various places. After the reconstruction we began the lengthy task of polishing. Rather than a completely smooth surface some antique items require a polished surface but still left with some wear and tear – that vintage aged look – which was what we were after here. It was virtually impossible to polish out all the scratches there would be no copper left! 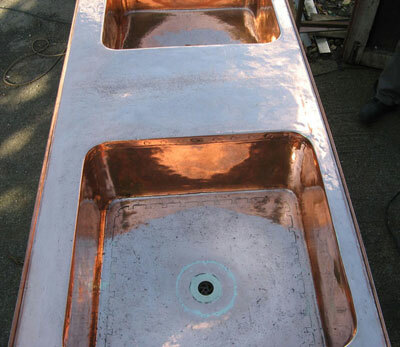 A similar project to the copper roll top copper bath and it arrived tired, dented and in need of two new outlets in each sink and repairs to the seams and riveted areas as well as a complete realignment. First of all we repaired the sinks, soldered in two new outlets, tapped out dents and dealt with the shape and stretches. The copper was extremely thick goodness knows how heavy it was. This was an awkward job especially to man-handle which is why we made the timber frame. When all the reconstruction was completed we then set about polishing the face and some degree the underside. A basin such as this would have been used in an orangery or conservatory or perhaps even an out-house or utility room. Our client bought lots of old genuine French lanterns. Street lamps, lanterns from various chateaus around France, we would sometimes even end up with old stock from regional French councils who sold off their ancient street furniture, reclamation all sorts. We would often construct complete lanterns from whatever materials or lanterns parts we had such as the ones pictured. Sometimes we had to make sections and age them down, other times it was possible to assemble an entire lantern from genuine period pieces.